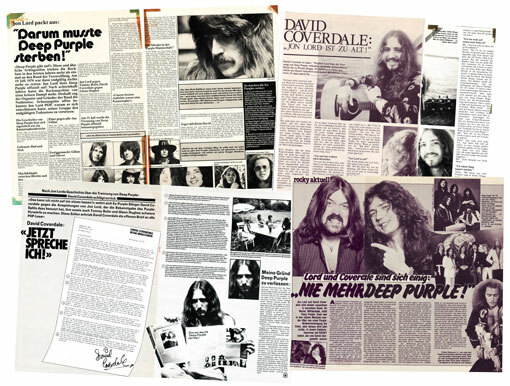 I had reason to look at the old Deep Purple collection recently for a project and the war of words between Jon Lord and David Coverdale in German media in the fall of 1976 popped up. I have to admit that I haven´t read this stuff in years, and that it is quite interesting to revisit. Initially, when Deep Purple announced the split back in July 1976, the few interviews that were made at the time (David Coverdale and Ian Paice in New Musical Express was the main one) was fairly noncommittal. The main issues (the drug abuse of some members etc) were not mentioned. They tried to be graceful about it in order to not hurt anybody´s future career. David lived in Germany at the time with his then wife Julia and it must have been quite a surprise for him to see the rather nasty interviews that suddenly popped up in German media with Jon Lord that fall. This resulted in David going on the offensive himself, gloves off. The resulting words were, at the time, the most honest that had come out of the recently defunct Purple camp. But it was a German media thing and, thankfully, it did not spread abroad. It never got to be a thing in the UK press or elsewhere. Two years later, they worked together again, and Jon once told me that he did regret the German affair. Still, the end of Purple had been a little bit nastier in Germany than anywhere else. This is all water under the bridge, but it was a horrible time for all of us back in the day. The split of Deep Purple in 1976 was a monumental thing for the fans. But for years, we knew very little of the real history, what it was that finally brought it to an end. The German affair was, for a long time, the only slip up from a very tight camp. Over the years, the facts have emerged, slowly, and I suppose most of it is fairly well established by now. Still, some matters are still touchy. The upcoming documentary about the bands 1975 trip to Indonesia will touch on a very raw nerve in their history. It is going to be interesting to see the new material.